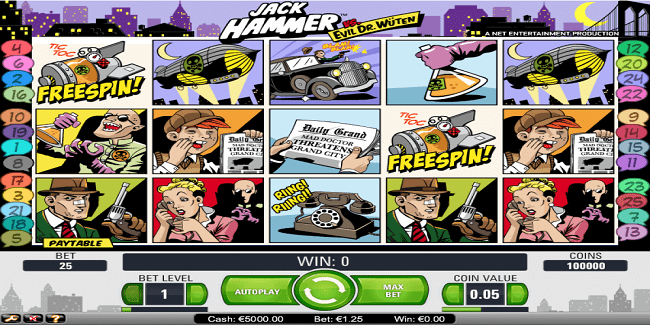 Jack Hammer is a NetEnt based 5 reels and 25 paylines slot game, which offers a jackpot of 1000 times of your total bet. This is a video slot with a Return of player percentage i.e. 97. The game is inspired by superheroes and about their fights. Players will able to see fights between superhero Jack Hammer and the Evil Dr. Wüten. 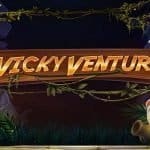 The graphics of the game are very unique, hence if you looking to play Jack Hammer slot then check out NetEnt casinos. Main buttons available in this game are ‘Coin value’ which is used to select coin denomination which ranges from 0.01 to 0.5, “Bet Level” is used to choos the bet line, which ranges from 1 to 10. “Circular arrow button” is used to start playing the game for a selected wager, ‘max Bet” option is that to place the bet for maximum amount i.e. to begin playing with 10 coins on all 25 lines, and “auto Play” option is used to Play the selected number of times continuously without any interruption. You can play Jack Hammer slot at any Desktop, smart phones or at any other operating systems with the help of real money. There is a Sticky Win feature in this game which comes after three or more “Tic-Toc” Bomb. The reels keep spinning as long as there is no new wins to be had. Wild symbol of the game is an explosive-looking item, which can be substitute for all other symbols excepting scatters, which are Free Spin. If five or more free spin symbols appear on any active reels, the free spin feature will be activated. 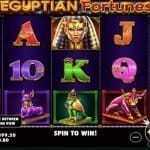 You would receive 10 free spins on five free spin symbols, whereas six free spin symbols will give you 15 free spins. 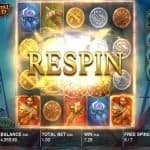 If you hit 9 to 15 Free Spin symbols, you would be able to earn 30 free spins. There is a very good chance of winning real good money here at this casino slot. You could win up to €750 000.